This bookmark is a perfect pick me up for a cold wintry day and is one of those projects that gives you instant satisfaction because of it’s simplicity. The following pattern includes instructions for making the bookmark with five different colors but mixing up colors or even using more or less will make for your own unique bookmark. Need help understanding the abbreviations and symbols? Check out the crochet abbreviation chart! Repeat Rounds 1 and 2 with colors B, C and D to make four posies total. Finish off, weave in all ends. Make it pretty! I went back and stitched the flowers together with a simple whip stitch, just so it would lay flatter. You can find a whip stitch tutorial here: How to Whip Stitch in Crochet. Loved this pattern and want to show us your end result, don’t be shy! ‘Like’ Crochet Spot on facebook and share the photos of your finished project! Have any questions or comments don’t hesitate to share here! This entry was posted on Saturday, February 19th, 2011 at 1:28 PM by Erin Burger	and is filed under Free Crochet Patterns. You can follow any responses to this entry through the RSS 2.0 feed. You can leave a response, or trackback from your own site. This is really cute! Thanks for the pattern. I love this bookmark! Such a sweet and simple idea! Just wondering, in Round 2, should the first (sc, 2 dc, dc) actually be (sc, 2 dc, sc)? I may be wrong, it just caught my eye. Thanks for the cute pattern! Yes! Good eye and thanks. Oh! So Cute!!!! Thanks, Erin! 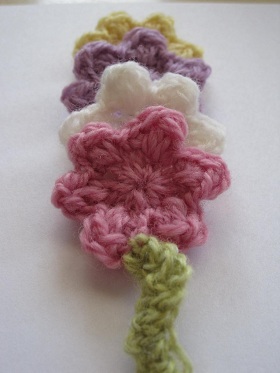 Cute Posies in a row bookmark but please tell me how to make that zig-zaggy cord. Would love to know! Thanks, LYNN. P.S. I am Always confused by crochet pattern language ie US or UK terms. I was taught to crochet in UK style! Lynn, all you have to do is make a chain however long you want, then turn and do single crochet up one side. it just naturally curls like that. 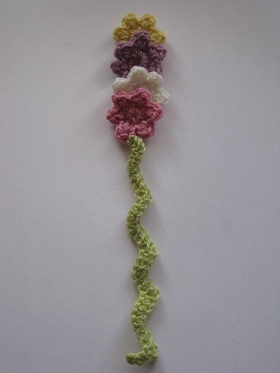 Thanks for replies to my question about zig-zag cord for posy bookmark. Thanks for this free pattern! It’s the cutest bookmarker I have ever seen!! Rachel, Always looking for very simple things for gkids and I was looking for a squiggle to make a worm out of and the stem will do very nicely. You have some really great things for beginners.Thanks so much for keeping your website so open and for everyone. Have a great day! Many years ago an ‘old’ woman gave me the oral pattern for a bookmark like this except it had a mouse head on the end. Would you happen to have that pattern. Would love it. Must try it Tom first thing in morning! Would have appreciated an answer. I wasnt looking for seeing my name in print. I am quite new to crocheting. I have managed the flowers and the tail, however I don’t understand where on the back of the flowers you used the simple whipstitch to make them lie flat. The picture shows the flowers as overlaid on each other and I am getting them attached in a line. Please help. Hi Leanda, I believe Erin (who made the pattern) meant for you to sew the parts of the posies together if you desire them to be more connected and flatter. Try whip stitching over the areas where the flowers overlap in the back. I look forward to trying out this pattern. Thanks!